Keep your flowers beautiful and crops protected from deer using these Gardeneer Deer-X Exclusion Nets. These generous nets, all crafted from durable polypropylene, are perfect for covering plants, or for surrounding your garden when used with posts (not included). Each of the 4 nets is 7' tall, preventing deer from jumping over them, and 100' long for use in garden rows or to fully surround a plot. The 0.75" mesh allows plenty of water and air to reach your plants, while deterring animals, and the black hue has UV inhibitors for durability. The mesh is easy to stretch taut between your posts (not included), and its flexible design provides plenty of versatility. Protect trees and plants from deer using these Deer-X Exclusion Nets. Made in the USA. 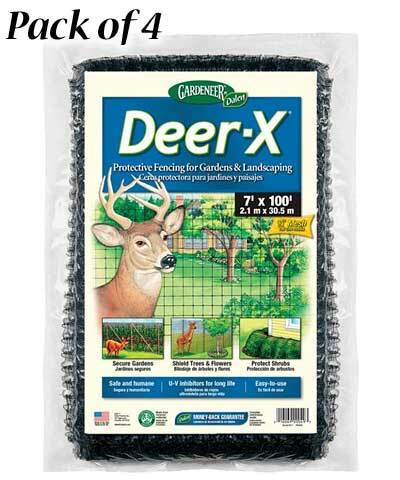 Note: This package contains 4 of the Gardeneer Deer-X Exclusion Nets, 7' x 100' each.